Our Automatic Shutoff Valves are designed for reverse osmosis systems with a capacity of up to 50gpd product water(50gpd membrane). 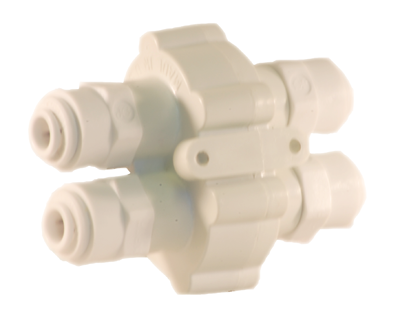 Product Description: The ASV2000N is a compact valve with four fully integrated 1/4″ tubing connections. This valve is designed for a reverse osmosis system with a capacity of up to 50gpd product water(50gpd membrane). The valve shuts off when the tank pressure reaches 60% of the line or feed water pressure. The ASV2000N has earned the Gold Seal for material safety and structural integrity from the Water Quality Association.